Gallia Commissioners and the Gallia Sheriff’s Office discuss the increased capacities and needs of the Gallia correctional program. From left to right are Commissioner Brent Saunders, Commissioner David Smith, Gallia Sheriff Matt Champlin and Gallia Sheriff’s Office, Office Administrator Heather Casto. Not pictured, Commissioner Harold Montgomery. 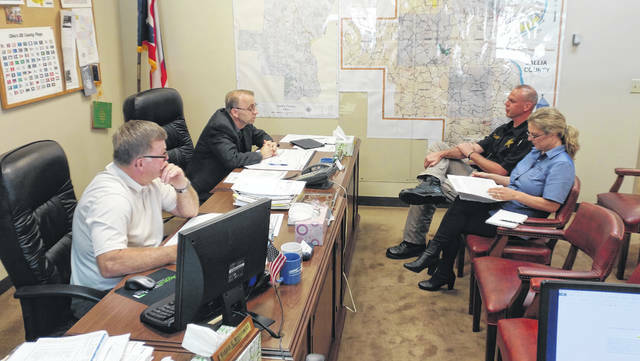 GALLIPOLIS — Gallia County Commissioners and the Gallia Sheriff’s Office gathered during the commissioner’s regular meeting Thursday in the Gallia Courthouse to discuss the growing financial needs of the Gallia correctional system. Gallia Sheriff Matt Champlin said Gallia handles between 95 to 105 inmates daily either in the Gallia Jail, the Gallia Work Release Center or abroad in contracted correctional facilities. Expenses for inmates have measured between $60 and $70 a day in the past, according to Gallia Commissioner David Smith. Champlin has said transporting inmates can be an issue as the county has contracted with other correctional facilities across the state to house a growing inmate population. The Gallia Jail is a 22 bed facility, but at times may house several more inmates to keep up with drug-related crime arrests with the heroin epidemic. According to numbers discussed during the meeting, the sheriff’s office has spent $333,000 on out-of-county inmates in food, housing and medical costs from the beginning of the year and into the end of May. Saunders noted that the overcrowding of jails was a trend throughout the state for rural governments and said he felt the state would eventually need to do something to help local governments. Champlin agreed. An appropriation of $50,000 was approved by the commissioners to meet current sheriff’s office needs but budget concerns for the rest of the year would need discussed more in the future, said officials. Commissioners said the Gallia general fund has around $8.6 million. With total judicial and law enforcement obligations, around 46 percent of the fund in the past has been dedicated to those needs alone.